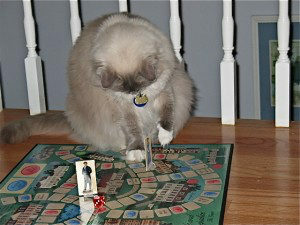 I have no idea why or how I came up with idea of Pride and Prejudice and Kitties – a thoroughly ridiculous idea at best! But then, Jane herself has an appreciation of the ridiculous. And I like having fantasies about my cat’s pursuits and preoccupations. Isn’t that what cat-lovers do, have fantasies about their cats? Dog-lovers don’t have fantasies because dogs act out everything and leave no room for the imagined. When our book came out, my coauthor, Debbie and I, were roundly accused of copying Pride and Prejudice and Zombies.. But the (unhappy) truth was we’d had been working on our concept and honing our query for over six years. Not to mention that it took almost eighty agents before we found one who sold the book. Originally the publisher asked for 100,000 words to go with the photos – almost as many words as in Pride and Prejudice itself! We got them down to 30,000 but even now I speculate on whether it would have been better to have fewer words to go with the photos. Take heart, though! We may come out with Mansfield Bark before long! 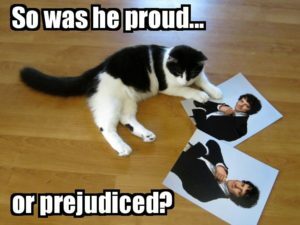 If you see the last photo in Pride and Prejudice and Kitties, you’ll understand!